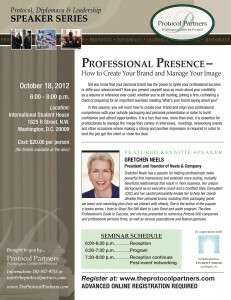 Did you know that your personal brand has the power to ignite your professional succes or stifle your advancement? How you present yourself says as much about your credibility as a resume or reference ever could, whether you’re job hunting, joining a firm, cultivating a client or preparing for an important business meeting. What’s your brand saying about you? In this session, you will learn how to create your brand and align your professional competence with your outside packaging and personal presentation in order to build confidence and attract opportunities. It is a fact that now, more than ever, it is essential for professionals to manage the image they convey in interviews, meetings, networking events and other occasions where making a strong and positive impression is required in order to land the job, get the client or close the deal. Gretchen Neels has a passion for helping professionals make powerful first impressions and establish more lasting, mutually beneficial relationships that result in more business. Her unique background as an executive coach and a Certified Style Consultant and her candid personality enable her to help her clients develop their personal brand, including their packaging (what we wear) and marketing plan (how we interact with others). She is the author of the popular e-books series, I Hate to Shop! But Still Want to Look Great and audio program, The New Professional’s Guide to Success, and she has presented to numerous Fortune 500 companies and professional services firms, as well as various associations and federal agencies.